Fiat and other carmakers have warned that removing tax breaks would hurt sales. MILAN, (Reuters) – Italy's car sales are down 20 percent in April, an industry source said. If correct, the decline would be at the worst end of predictions from market leader Fiat, which expected a drop as the lingering effect of government incentives ended in March. Orders were down about 27 percent in April, the source added. That result is slightly better than expected. Official figures for April sales from the Transport Ministry are due to be published on May 3. 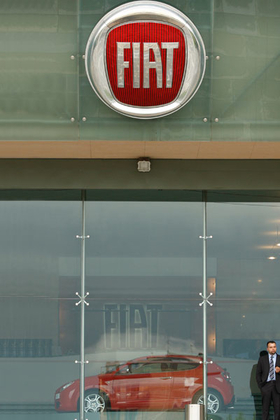 Fiat brand CEO Lorenzo Sistino said earlier in April the market could be down 10 percent to 20 percent this month. Foreign carmakers' association UNRAE said in the middle of the month that sales would fall 20 percent and orders would be down 30 percent. Fiat and other carmakers have warned that removing tax breaks to buy cleaner cars would hurt sales. Rome did not renew the incentives this year but cars bought under the scheme could be registered until March 31, 2010. Carmakers worldwide are facing the reality of life without sales support as governments end costly tax breaks introduced to help the industry through the global financial crisis and protect jobs. Fiat, which sells about 30 percent of all cars in Italy through its Fiat, Lancia and Alfa Romeo brands, outlined its strategy for the next four years last week.